There's an episode in Donald Trump's past that shows just how far this billionaire businessman will go to get his way. It began in 1981. 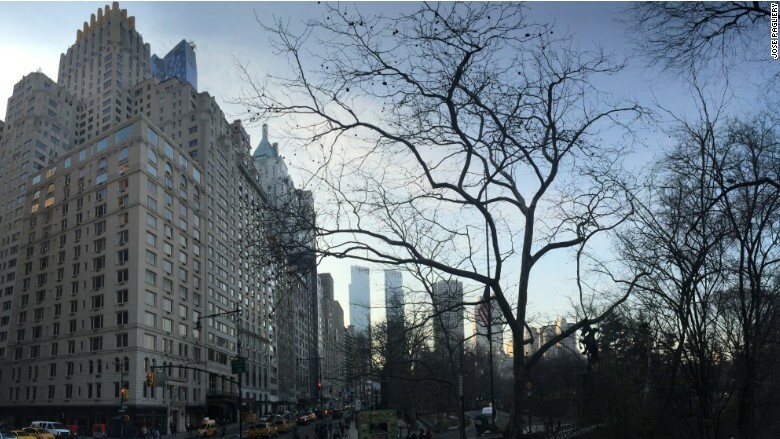 Trump bought a 14-story building on prime real estate facing New York City's Central Park. His plan was to tear down the building and replace it with luxury condos. But first he needed a small band of rent-stabilized tenants out of there. To succeed, Trump played rough, according to lawsuits filed by the tenants. Renters said he cut heat and hot water, and he imposed tough building rules. Trump even proposed sheltering homeless people in the building. It went on for five years as Trump fought tenants, real estate lawyers, New York state regulators and city officials. CNNMoney reviewed 2,895 court documents -- most of them now only available on microfiche at New York state courts -- that detail a fight that's now largely forgotten. The apartment buildng at 100 Central Park South, as seen in 2016, was the site of an epic battle between Trump and rent-stabilized tenants. 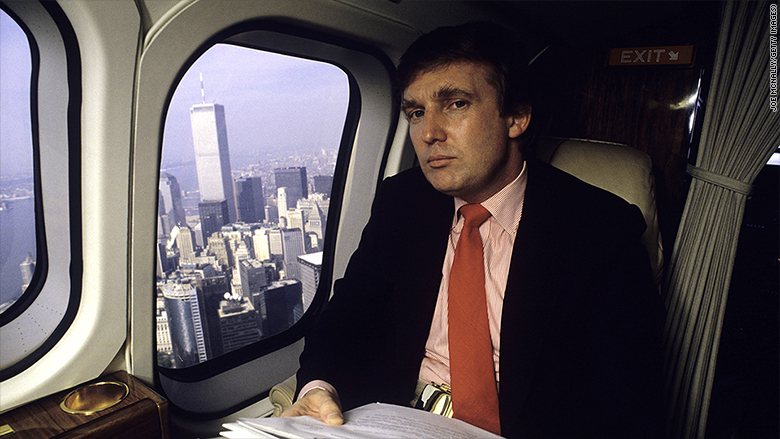 By 1981, Trump was already the epitome of American business bravado. At 35 years old, he had cut historic multi-million dollar land deals, saved a blighted midtown Manhattan subway hub, and was in the process of erecting the black-framed glass behemoth of Trump Tower. The next move in his real life game of Monopoly came in July 1981, when he bought a hotel and its neighbor, a rent-stabilized building at 100 Central Park South. Two months later, he applied for a demolition permit to blow it up. Trump fired the building manager and replaced him with Citadel Management. In his book, The Art of the Deal, Trump himself said he chose a company that "specialized in relocating tenants." Just a few months later, on New Year's Eve, several tenants received identical "lease violation" warning letters. The previous building owner had given renters permission to knock down walls and renovate their apartment units. But Trump was reversing that exception, and renters had only 12 days to rebuild the walls -- or face eviction. The renters hired a real estate lawyer known in New York City for being particularly aggressive. They sued Trump and his company, Park South Associates. CNNMoney identified at least two instances in which New York state judges stepped in to put Trump's lease violation notices on hold. In their 1982 lawsuits, the tenants said Trump had cut off their hot water and heat during New York's freezing winters and stopped all building repairs. One claimed he allowed "a rodent infestation of the premises." Another said he imposed burdensome new rules in an attempt to force them out. For example, Trump's new building manager claimed there was a burglary in the building. Dentists with apartment offices were ordered to send patients to the garbage-filled service elevator, according to building management documents and a dentist's lawsuit that tried to fight it. Dr. Michael Richman refused to comply with the new rule, complaining in court documents that Trump "mounted a campaign of harassment." "Mr. Trump is willing to resort to any device or tactic to drive out the tenants from the building," he said. Trump's lawyers fought back, questioning whether the dentist's office even qualified for rent control. Back then, many of the building's tenants were retirees or older professionals and have since died. All that remains of their tale is detailed in sworn affidavits and court testimony. 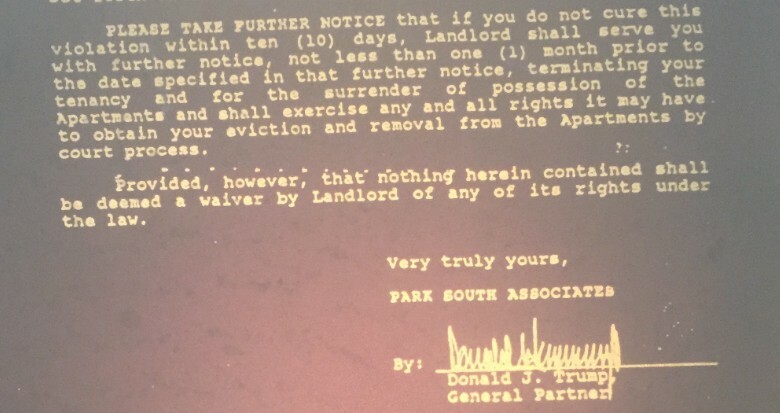 One time, Trump sued a tenant for not paying rent -- even though the guy, Anderson Clipper, actually did. New York City Judge Jay Stuart Dankberg eventually blasted Trump for the "spurious and unnecessary" lawsuit, according to The New York Times. The judge dismissed the lawsuit, said Trump was trying to "harass" Clipper, and forced the developer to refund 5% of Clipper's rent. "To most landlords happiness is having tenants who pay the rent each month without prodding or litigation," Dankberg wrote. "However, [Trump] is apparently searching for double happiness." Clipper died this past October. His 72-year-old estranged wife, Nancy Clipper, didn't live with him at the Trump-controlled apartment building. But she remembers all he endured with Trump as his landlord: the lawsuits and the refusal to fix things. "It was really a horrible experience," she recently told CNNMoney. "He was insensitive, rude, and just a generally nasty man. I would never have considered him presidential." Trump tells a very different story in his book, The Art of the Deal. He described the renters as privileged, rich "yuppies" who benefited unfairly from rent-control. The rent Trump collected barely covered expenses. That's why he installed cheaper light bulbs and cut back, he wrote. "If there's one thing I've learned about the rich, it's that they have a very low threshold for even the mildest discomfort," Trump wrote. To be fair, these people had an unbelievably sweet deal: low-rent homes a short stroll away from Broadway theaters and Carnegie Hall. Dr. Richman paid $700 a month for Apartment 5C. Fashion designer Arnold Scaasi paid $985 for his mind-blowing, six-bedroom with killer views of the park. In New York City, this is the stuff of legend. But the law protected them. Yet Trump kept up the pressure. The building's superintendent, Anthony Ramirez, swore in court that Trump's building managers gave him explicit instructions. "They didn't want any repairs done. No cleaning. No accepting of packages," Ramirez said, according to transcripts of a court hearing. As a result, Scaasi's luxurious apartment was plagued by water leaks -- one that put at peril his art collection, which included a 1926 Picasso painting and works of art by Claude Monet and others. A 10-month water pipe leak in Apartment 14B got so nasty that two brothers who grew up in there saw brown-and-white mushrooms sprouting from their bedroom carpet, according to court documents and recent CNNMoney interviews. "It felt like we were under attack," one of the brothers, now 57 and living north of the city, told CNNMoney recently. "Trump did his best not to repair anything." Then it got really dirty. Trump put out newspaper advertisements in 1982 and 1983 offering to shelter homeless people in the apartment building. The move was seen by tenants as a ruthless attempt to drive them out. Trump denied that, telling The New York Times: "Some people think I'm just doing a number on the people in the building. That's not true. I just want to help with the homeless problem. It'll take two or three years to get everybody out, and in the meantime I'll have more and more vacant apartments for the indigent." He even offered to pay for nurses and medical supplies to treat the homeless. But a top city official, Human Resources Administration deputy administrator Robert Trobe, told the Times that Trump's offer did "not seem appropriate." There was alleged spying too. Trump's building manager told Ramirez, the superintendent, to monitor "the personal habits of the tenants" and "keep a list on the tenants' activities," according to his repeated sworn testimony in several transcripts. "Sir, I have too many things on my conscience at this late stage in life, and I don't need anymore headaches. I'm here to do my job and to do repairs to the building," Ramirez recalled telling a building management representative. "What are you, Born Again Christian?" the manager replied. In a sworn affidavit signed April 18, 1985, Trump denied these complaints. First, Trump claimed he didn't directly run the building owner, Park South Associates (even though corporate documents show he owned 60% of the company and was the only listed officer). Then he swore he kept the building in tip-top shape. Plus, a previous year's inspection by New York state's housing agency backed him up, finding that "all public areas were clean." But in 1985, that same state agency went after Trump too. New York state's Division of Homes and Community Renewal sued, charging him with harassing tenants. Months later, the city of New York filed a similar suit. There was a brief glimmer of peace that year. According to court documents, Trump and the leader of the tenants' association discussed a potential deal: The renters would team up and buy the building for $15 million -- and free themselves from their landlord. But Trump used that opportunity to accuse the renters of shady behavior: using lawsuits of harassment to cover up their real mission. Tenants were "waging a ceaseless guerrilla-type war... to coerce a bargain sale of the building," Trump's attorneys claimed in court documents. He sued them for $150 million. It only escalated the legal battle. By 1986, Trump had spent more than $1 million fighting the tenants, according to his attorneys at the time. By comparison, he'd spent $160,000 in repairs over four years, according to statements filed by his legal team. Trump finally settled with the tenants' association in 1986. He cut their attorneys a $550,000 check and agreed to let the housing agency monitor repairs for five years. But the alleged harassment dragged on with one elderly couple, Alvin and Catalina Meyer. The elderly woman was dying of cancer and plagued with emphysema -- so it was a particularly rude awakening when Trump's construction workers woke her up at 7 a.m. by drilling holes in the ceiling above her bed. The construction crew had also set up a workstation in the apartment next door, and Mrs. Meyer complained of the dust in the air. "I am a very sick woman battling for my life," she said in court papers. "I have begged for reasonableness. The landlord will not be reasonable." After nearly a decade of nonstop fighting, tenants started turning on one another. Trump said he couldn't fix the building's heating system, because Meyer didn't give construction workers access to her apartment. Fellow tenants told Meyer to back down. Meyer's lawsuit fizzled out when her own attorney left her. The fighting died down in the 1990s -- then popped up again in 2000 when 72-year-old Carmel Reingold in Apartment 2A sued Trump in New York State court when he overcharged her $40,000 in rent over four years. He paid that money back. 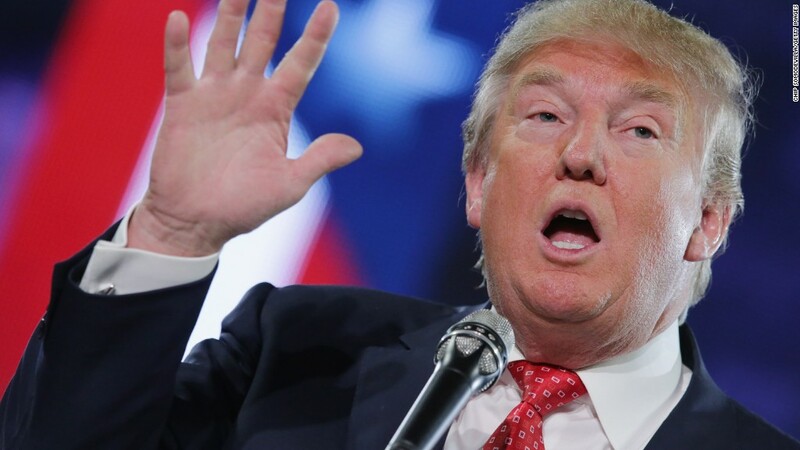 CNNMoney reached out with questions to Trump's 2016 presidential campaign several times over the past week, but has received no reply. In the end, no judge ever ruled that the tenants were being harassed. After all, he did settle. But Trump didn't get his way either. The building remains in place today. Trump's company owns 18 units, according to city records. Trump's son, Eric, owns a flat on the top floor. At least two renters actually bought their apartments. Most moved away. But it remains a defining moment that shows his character, said Wayne Barrett, an investigative journalist in New York who documented the businessman's empire in the book Trump: The Deals and the Downfall. "This was a concrete choice he made, knowing he would disrupt the lives of many middle income, elderly people," Barrett said. "He has absolutely no excuse."